The Twelfth Young Researchers' Conference "Materials Science and Engineering"
The 12th Young Researchers' Conference "Materials Science and Engineering", held on December 11–13, 2013, at the Institutes' Building of the Serbian Academy of Sciences and Arts, was organized by the Materials Research Society of Serbia and the Institute of Technical Sciences of SASA and financially supported by the Ministry of Education, Science and Technological Development. The conference traditionally gathers MSc and PhD students, as well as PhDs younger than 35. 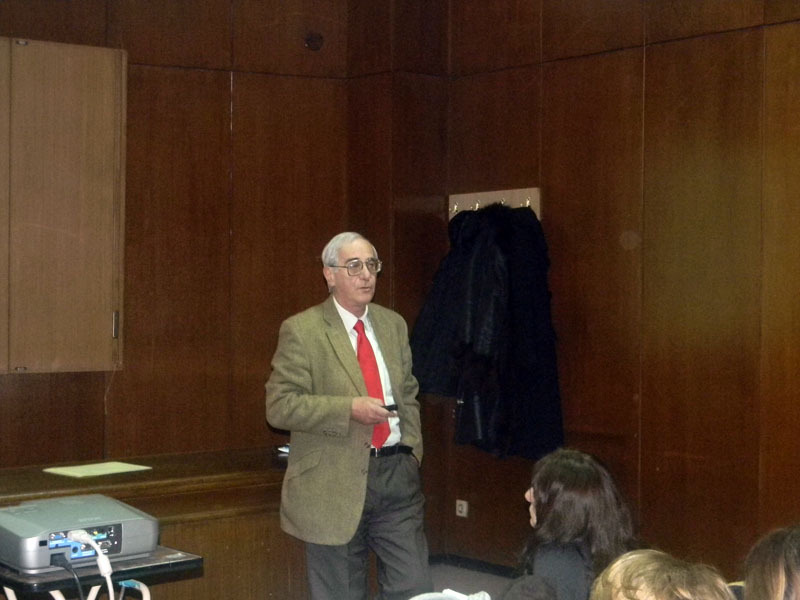 In 2002, when the Materials Research Society of Serbia and the Institute of Technical Sciences initiated a meeting of young researchers, the result was a seminar with no more than 27 participants and all of them came from Serbia. Over time, the number of participants steadily increased 2003 – 30, 2004 – 26, 2005 – 29, 2006 – 50, 2007 – 57, 2008 – 61, 2009 – 72, 2010 – 74, 2011 – 82, 2012 – 71). In 2008, the seminar was transformed into a conference. In 2010, the conference became international with English as the official language. It is very important to point out that no participation fee is paid for this conference. Over the years, the conference has been very popular among young researchers in Serbia because to many of them it has offered an opportunity to present their results orally and thereby overcome the beginners' hurdles, to discuss with their colleagues various scientific or technical issues that they encounter in their everyday work, and to exchange ideas, as well as to make new friends and broaden the basis for further collaboration. 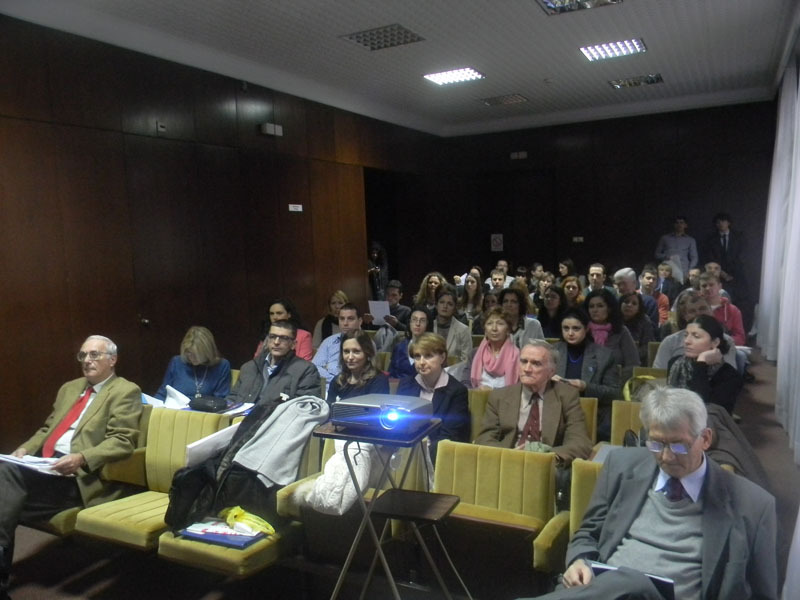 The 12th Young Researchers' Conference was inaugurated by Dr. Smilja Marković, president of the Conference Committee. Having welcomed Conference participants and guests, she briefly referred to the previous eleven conferences. Welcoming addresses were also made by Professor Dragan Uskoković, president of the Materials Research Society of Serbia, and Academician Zoran Đurić, director of the Institute of Technical Sciences of SASA. 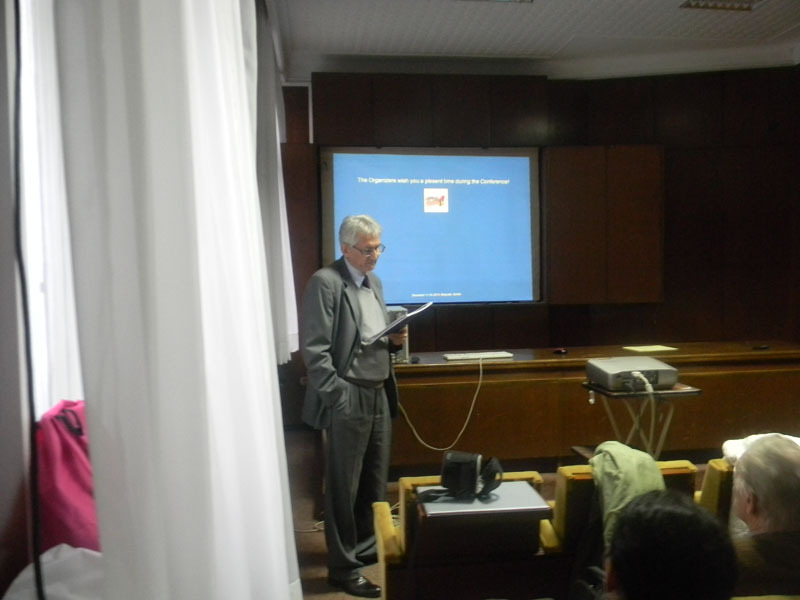 Professor Uskoković briefly outlined the development of the Materials Research Society of Serbia and its actions related to the YUCOMAT and Young Researchers' Conference. In his welcoming speech, Academician Đurić pointed out the importance of the applicability of research, as the only way to ensure global technological development. After Dr. Dragana Jugović, vice-president of the Conference Committee, had delivered diplomas to the laureates at the 11th Young Researchers' Conference for the best presentations, the official programme began. The inauguration ceremony was followed by presentations, which were divided into the following topics: Biomaterials, Nanomaterials, Theoretical modelling, Metallurgy and Corrosion, Polymers, Optical Materials, Electrochemistry and Magnetic Materials, Sintering, Environmental protection and Various Issues Related to Materials Science. There were 83 submitted abstracts from ten countries (Albania, Czech Republic, Germany, Montenegro, Pakistan, Poland, Romania, Russia, Serbia and the United Kingdom). Eighty percent of participants came from Serbia. Out of 83 submitted presentations, 73 were presented. All presentations were oral and lasted for 15 minutes. This was the sixth successive conference where the best presentation were awarded. 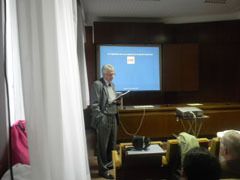 The awards are provided by the Materials Research Society of Serbia. The best presenters were awarded free participation at the 16th Annual Conference of the MRS – Serbia – YUCOMAT 2014, to be held in Herceg Novi, Montenegro, on September 1–5, 2014, as well as diplomas. The parameters taken into account by the Awards' Committee and two chairpersons at each session included the quality of research (originality, innovation and advance it provided compared to previous research), as well as the quality of presentations (terminology, intelligibility and the quality of answers to questions posed by the chairpersons and the audience, as well as the technical aspects of the presentation). Since there were many excellent presentations which may be put side by side with current research in international centres, the Awards Committee (Dr. Smilja Marković, Dr. Dragana Jugović and Dr. Magdalena Stevanović) decided to give three equal awards and this decision was supported by Prof. Dr. Dragan Uskoković on behalf of the Materials Research Society of Serbia. Jovana Zvicer, PhD student, "Cytotoxicity of Ag/alginate nanocomposites: in vitro and in vivo studies", authored by: Jovana Zvicer (1), Lenart Girandon (2), Urška Potočar (2), Mirjam Fröhlich (2,50, Ivan Jančić (3), Biljana Bufan (3), Marina Milenković (3), Jasmina Stojkovska (4), Vesna Mišković-Stanković (1), Bojana Obradović (1), 1 Faculty of Technology and Metallurgy, University of Belgrade, Belgrade, Serbia, 2 Educell d.o.o. Ljubljana, Slovenia, 3 Department of Microbiology and Immunology, Faculty of Pharmacy, University of Belgrade, Belgrade, Serbia, 4 KreativTeh LLC, Belgrade, Serbia, 5 Department of Biochemistry, Molecular and Structural Biology, Jožef Stefan Institute, Ljubljana, Slovenia. 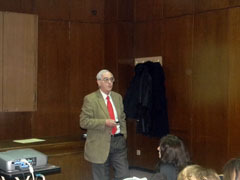 Dr. Marko V. Lubarda, "Advanced computational methodologies for modeling realistic polycrystalline magnetic films and devices", Faculty of Polytechnics, University of Donja Gorica, 81000 Podgorica, Montenegro. Ivana Jevremović, PhD student, "Use of quartz crystal microbalance (QCM) measurements to investigate novel top-of-the-line corrosion (TLC) mitigation method", authored by Ivana Jevremović (1), Feranando Farelas (2), Marc Singer (2), Srdjan Nešić (2), Vesna Mišković-Stanković (1), 1 Faculty of Technology and Metallurgy, University of Belgrade, Belgrade, Serbia; 2 Institute for Corrosion and Multiphase Technology, Ohio University, Athens, OH, USA. Dr. Rafał Poręba, "Preparation and characterization of waterborne polyurethane dispersions and films", autora: Rafał Poręba, Magdalena Serkis and Milena Špírková, Institute of Macromolecular Chemistry AS CR, v.v.i., Heyrovskeho nam. 2, 162 06 Prague 6, Czech Republic. Violeta Nikolić, PhD student, "Spin glass like behaviour of magnetite nanoparticle system obtained by thermal decomposition of acetylacetonate precursor", authored by Violeta Nikolić, Vojislav Spasojević, Vladan Kusigerski, Marija Perović, Ana Mraković, Marko Bosković, Jovan Blanuša, The Vinča Institute, Condensed Matter Physics Laboratory,University of Belgrade, P.O. Box 522, 11001 Belgrade, Serbia. It should be pointed out that the Young Researchers' Conference would not be so successful without the help of experienced and affirmed colleagues, whose professional development was accompanied by conferences organized by the Materials Research Society of Serbia – YUCOMAT, since 1995, and the Young Researchers' Conference, since 2002. These "older" researchers – scientists and professors – are now members of the Conference Committee and chairpersons at conference sessions, they encourage younger colleagues to present their work and improve the quality of discussions by their questions, comments and advice, seeking to motivate and inspire further work of young researchers. 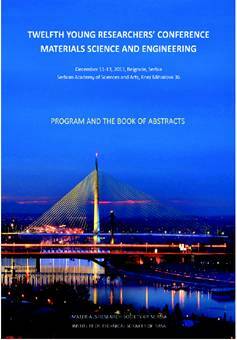 The Conference Programme and all submitted abstracts are published in the book Twelfth Young Researchers' Conference – Materials Science and Engineering, Program and the Book of Abstracts available to interested audiences worldwide on the website of MRS - Serbia and Google Books http://books.google.rs/books?id=BmtKAgAAQBAJ&printsec=frontcover&hl=sr&source=gbs_ge_summary_r&cad=0#v=onepage&q&f=fals. In conclusion, in the aftermath of the 12th Young Researchers' Conference it may be said that the active participation of presenters, chairpersons and guests created an atmosphere of a high-quality conference, comparable to young researchers' conferences in Europe and worldwide.